Marked seven pipes for perforation. Marked at 5 and 7 o’clock every 15cm beginning at 30cm. Drilled holes on the center of the markings. 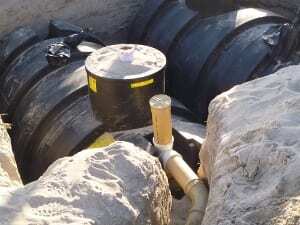 Attached caps onto the end of each perforated pipe where the last drain hole is 15cm from the end. Cleaned the inside of the cap and the outside of the pipe. Placed PVC cement on both the inside of the cap and outside of the pipe. Attached the pipe and cap. Twisted the cap a quarter of a turn to remove air bubbles. Twisted the fitting a quarter of a turn, matching the lines drawn for alignment purposes. Built a u-bend to be used as an access point for testing purposes. Measured placement of greywater trenches and marked using stakes and strings. Determined an estimated location of the outlet pipes near the fence, and marked it with a stake. Measured a distance of 7m away from the outlet pipe to the area designated for the leach field. Marked out trench for the distribution trench (4.5m x 0.5m for the greywater leachfield and 2.9m x 0.5m for the blackwater leachfield) with the longest side parallel to the fence. Dug the trench until it is 0.5m deep. Measured placement for the finger trenches and marked with string. Dug trenches until it they are 0.7m deep. Leveled the bottoms of the trenches. 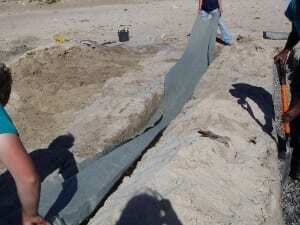 Placed a 3m level across the top the trenches, making it level using bricks and sand. Placed a brick beneath the level in each trench. Measured the distance between the top of the level and the top of the brick. Adjusted the height of the bricks until the trenches are an equal distance below the level. Level the trench by using the bricks from 5(a) as a reference point. Add gravel so that it is level at least 0.3m from the top of the trench. Glue connecting pipes in place. 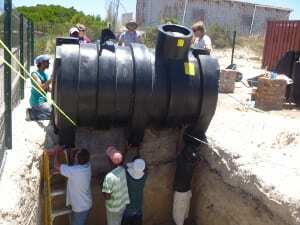 Use a 3m level to level the distribution pipe. Add or remove sand from under the pipe until it is level across the distribution trench. Fill around the pipes in the finger trenches with gravel so that only the top of the pipe is showing. 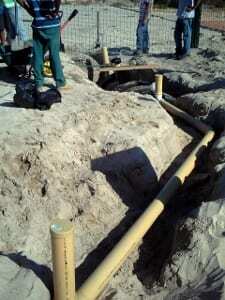 Lay irrigation cloth over each pipe in the finger trenches. Cover the pipes with sand. Compact the newly placed sand. Dug the holes for the greywater and blackwater tanks. Made concrete for pad beneath the tanks. Used a cement to sand ratio of 1:3 (one bag of cement for every three wheelbarrows of sand). Added water until desired consistency was reached. Placed a layer of concrete 0.08m thick covering the bottom of each hole. Leveled using a straight piece of wood with a level placed on top of it. Allowed the concrete to dry for half a day. Placed the tanks into the appropriate hole (making sure the blackwater tank with the baffle is on the appropriate side of the hole). Adjusted the tanks as necessary. Installed an access point for the first compartment of the baffled blackwater tank. Ensured tanks are spaced and leveled properly. Placed concrete into hole until 1/3 of the way filled. 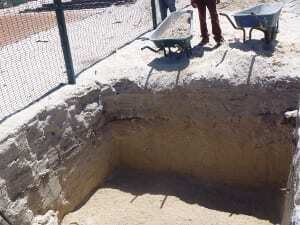 Placed sand into the hole until the sand reaches a level that is 20cm below the manhole cover. Placed another layer of concrete until it is only 2cm below the manhole cover. Leveled concrete in same manner as 5(a). Placed concrete in the manhole covers. Use concrete that is made with stone and is a 1:5 cement bag to wheelbarrow of sand ratio. Mark out piping for the connection between the tanks and their respective leach field. Mark the outlet location of the tanks with a stake. Tie string between the stakes and level with a string level. Measure horizontal and vertical distances to determine the available pitch. Dig connecting trench for the pipe that leads directly into the entrance of the leach field. Create a smooth, even slope (which is 1m down for every 40m across) throughout the trench. Dig trench a little deeper to accommodate for the u-bend. Mark all angles on joints to ensure appropriate fitting. 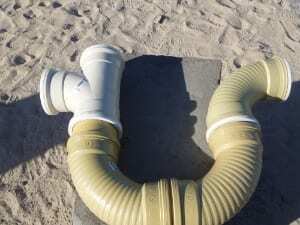 Adjust pipe levels accordingly by adding or taking away sand. Mark out piping for the connection between the tanks and the location of the ablutions container. Mark the inlet location of the tanks with a stake. 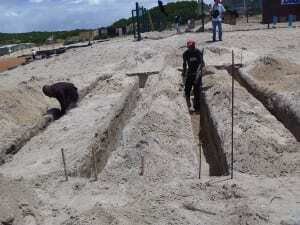 Cover piping with sand, placing sand beneath the pipes first to ensure pipes do not bow, and then carefully place sand above the pipes. 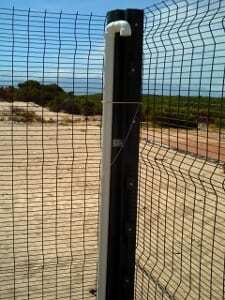 Run a pipe from the vent, the length of the tank toward the fence, and then to the corner fence post.